While your child’s baby teeth aren’t permanent and will eventually be replaced by adult teeth, that doesn’t mean that you can let your child’s dental care slide. Taking the time to take proper care of your child’s oral health now will help to protect it in the future. Believe it or not, those baby teeth serve many incredibly important functions. One of the most important functions baby teeth serves as are guides for when the permanent teeth erupt. They do this by holding the space for the grown-up teeth. When the crowns of the permanent teeth erupt, they actually push against the roots of the baby teeth. This causes the roots to either melt away or resorb. Furthermore, your child’s baby teeth are with your child as they learn to chew, bite, and speak. 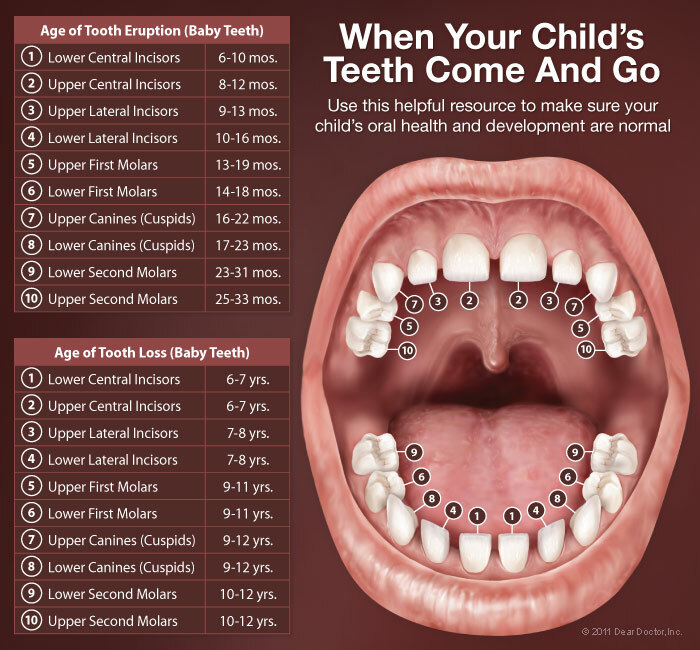 For those first six or so years of your child’s life, they will rely exclusively on these primary teeth to perform these functions, and some of those teeth will even hang on until your child is around 12 years old. Your child needs their baby teeth to stay healthy, and you want them to fall out naturally, not to be pulled or fall out due to decay, which is why it’s so important to ensure that you are taking proper care of your child’s baby teeth. 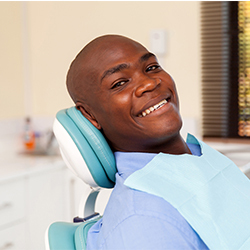 This includes regular checkups with a pediatric dentist. 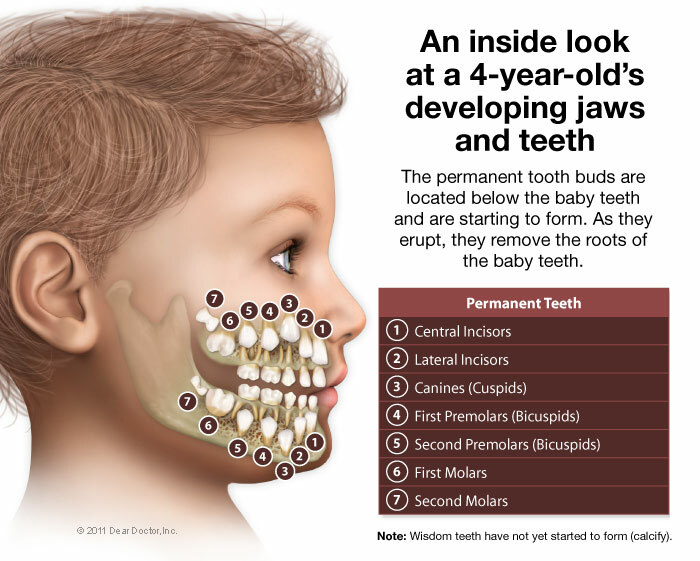 Your child has 20 baby teeth, and they will typically begin to appear within the first six to nine months; however, some kids’ teeth start to appear early (at around three months) or late (at around one year of age). The first baby teeth to come in will be the molars, followed shortly after by the canines — also called eyeteeth. When these baby teeth erupt, it can cause your child pain and discomfort. Pediatric dental care starts even before your child’s first tooth erupts. Your child’s gums, as well as any baby teeth that may have erupted, should be gently wiped after every feeding with a damp washcloth or gauze pad that has been soaked in water. Once your child is around two years old, start establishing a daily routine of brushing their teeth with a soft-bristled toothbrush and a small amount of fluoridated toothpaste. You may need to help your child brush their teeth until they are around six years old. According to The American Academy of Pediatric Dentistry, you should take your child to see a dentist for the first time before he or she turns one year old. This sounds early to many parents, but it’s an essential part of your child’s oral health. 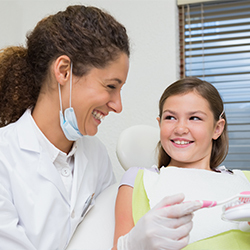 Our pediatric dentist will check for cavities, watch out for early signs of developmental problems, and teach you techniques for proper pediatric dental care. Don’t be fooled into thinking that dental decay can’t affect babies and small children. In fact, there are many different forms of decay that babies and small children are prone to. Early Childhood Caries, for example, can develop quickly. In six months or less, this form of tooth decay can progress from the outermost layer of the tooth — the enamel — to the soft, inner layer of the tooth, called dentin. Not only is it important to ensure that your child gets the dental care they need from a young age, but it’s also important to take steps to ensure that your child will have a positive experience when they visit the dentist. This will make it easier for your child to get the dental care they need throughout their lives. Topical Fluoride — Fluoride is applied to the enamel of the teeth, where it helps to make it harder and improve its resistance to decay. There is usually a small amount of fluoride in most toothpaste, as well as in the drinking water of most cities; however, a higher concentration can be applied to your child’s teeth by your family dentist, helping to provide the maximum amount of protection. 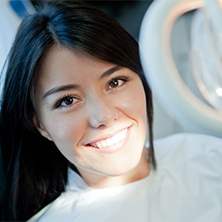 Root Canal Treatment — Root canals help to restore teeth that would otherwise have to be pulled due to decay or injury. Because your child’s baby teeth act as guides to the permanent teeth that form beneath the gumline, taking every possible measure in restoring the baby teeth is essential. Preventing the premature loss of baby teeth with root canals helps to prevent malocclusion – or bite issues – that require the help of an orthodontist. 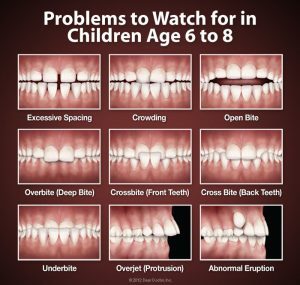 By the time your child reaches the age of around seven, most bite problems are evident. 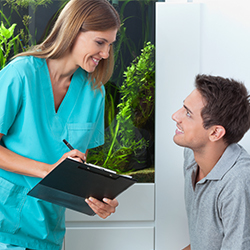 You can help to encourage proper tooth positioning and jaw growth at this time with interceptive orthodontic treatment, and it will help to reduce or even eliminate the need for orthodontic treatment later on. Many of the problems that require orthodontic intervention can be detected at an early age, which is why it’s so important to have your child regularly evaluated as they are still growing and developing. Is your child active in sports? If so, it’s highly recommended that they wear a custom-made mouthguard. According to the American Dental Association, athletes who don’t wear mouthguards have a 60 times higher chance of suffering dental harm than those who do. Custom mouthguards are made using a mold of your child’s teeth, and they’ll offer far more protection than standard, one-size-fits-all mouthguards. The investment in a custom mouthguard will pay for itself by preventing pain and the need for expensive dental procedures later on. This is a must-read overview of the stages, transitions and milestones in a child’s dental development from Dear Doctor magazine. In it, you’ll learn how to prevent everything from dental injuries to tooth decay, as well as how to promote overall health and well-being for years to come. Many women are hypervigilant about their health during pregnancy, but too often, pregnant women don’t understand that their overall health is linked with their dental health, and they don’t realize that poor dental health can actually have an impact on their developing baby. This article will teach you how to properly care for your oral health during pregnancy. Helping your child develop healthy dental habits now will help to establish lifelong oral health, and you should start developing those habits as soon as the first teeth start to appear. This article will teach expert tips on how to help your child learn healthy oral habits during childhood and beyond. Don’t make the mistake of waiting until your baby actually has teeth to start setting the stage for good oral health. Oral hygiene and good nutrition are steps you can take right now, and it’s up to you to develop dental health routines that will prevent tooth decay and other dental problems. Read this article to learn how!